ONE of the best known Helensburgh men to die in action on the front in the first two years of World War One was a 39 year-old with twenty years service. 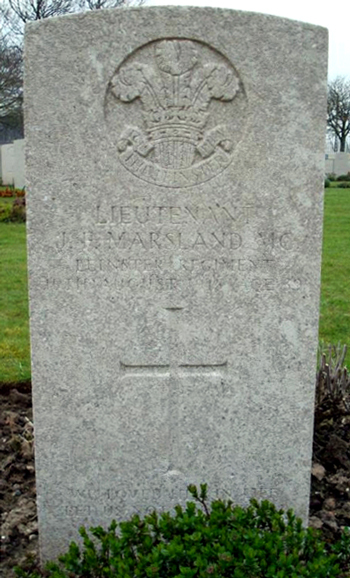 Lieutenant James Francis Marsland MC, known to his friends as Jim, was serving with ‘C’ Company of the 2nd Battalion (109th Foot) the Leinster Regiment (Prince of Wales’s Royal Canadians). He had been in France with the Expeditionary Force from September 1914, but died on August 15 1915 of multiple wounds received two days earlier. He received the injuries on patrol in No Man’s Land on the infamous Menin Road, between Birr Cross Roads and Hooge, and there are conflicting reports of what happened. There were high levels of patrolling by both sides and in any clash the first few seconds were vital. One report said that to give himself an extra edge Jim pulled the pin from a grenade and had it ready to throw. He was hit in the head by a bullet and although the wound was not immediately fatal it caused him to release the trigger of the bomb which then exploded, blowing his hand off. He was recovered to the British trenches and then a hospital, but there was never really any hope of him surviving. He held on for two days, but lapsed into a coma and died on the morning of August 15. Another report stated that he was on a bombing party attacking German trenches with three men when a Mills bomb he was holding was hit by a bomb thrown from the trenches, causing it to explode. It shattered his head and body. A slightly different version came from Sergeant T.Lafferty, who was with Jim on patrol. He said that they were lying out in No Man’s Land, and the Lieutenant pulled out the pin from a hand grenade. At that moment he was shot in the head, releasing the bomb which then exploded and blew his hand off. He was taken to 13th Field Ambulance and died either a day or two days later from his injuries at the Poperinghe Casualty Clearing Station in West Flanders. He was buried at Lijssenthoek Military Cemetary in Belgium, and his name is on the Helensburgh Cenotaph in Hermitage Park’s Garden of Remembrance. Jim was born on October 26 1896, the youngest son of a soldier, Quarter Master Sergeant James Marsland and his wife Lucy, who lived at Marine View, East Clyde Street. His father was a Crimean War veteran and janitor and drill instructor at Hermitage High-Grade School in East Argyle Street who died on October 23 1905 at the age of 77. Jim’s wife Mary and their children, James William (4), Renee (3) and Sheila (1), also lived at Marine View at the corner with Glenfinlas Street. At the time of his death she was pregnant with daughter Florence, born in 1916, and she was staying with her father, merchant William Casey of 25 Main Street, Tipperary. An obituary in the Helensburgh and Gareloch Times weekly newspaper said that news of the Lieutenant’s death was received in the town by his brother, Prudential Insurance agent Walter Ernest Marsland, of Craigbank House at the corner of West Clyde Street and Glasgow Street. Jim enlisted in his father’s regiment, the 1st Leinsters, around 1895, serving for ten years in the 1st Battalion and then transferring to the 2nd Leinsters with whom he was a Sergeant Major. He served through the South African campaign, winning two medals as well as the long service and good conduct medals. He also spent several years with his regiment in India and Canada. Shortly after the outbreak of World War One in 1914 he was commissioned as a Second Lieutenant, and quickly he was promoted to Lieutenant. 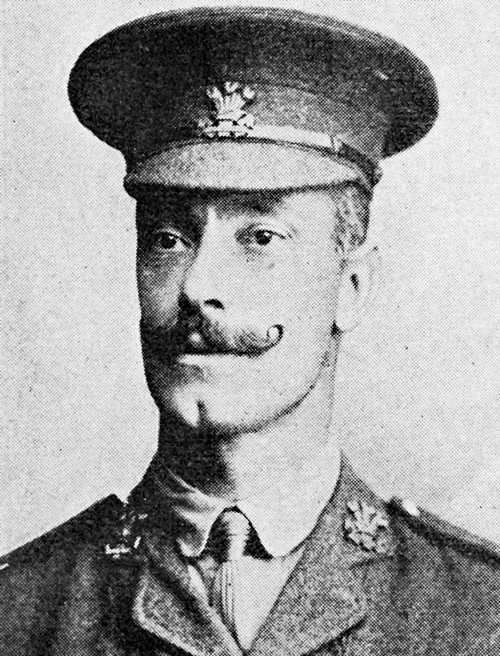 In June 1915 he was awarded the Military Cross for conspicuous bravery in the field. For a time during his service he was a drill instructor, and he particularly enjoyed club swinging, bayonet exercises, and martial arts. His elder brother, Lieutenant and Quarter-Master Fred Marsland of the Royal Army Medical Corps, a recipient of the Distinguished Conduct Medal while serving in Africa, was on the staff of the County of London War Hospital at the time. In a letter of sympathy sent to William Casey, Lieutenant John H. Monaghan wrote: “It is a sad business to have to tell you that Jim died here this morning from wounds received when out patrolling in front of the trenches two nights ago. “He was out with three men, and I believe was going to bomb the Huns. “He was unconscious up to the time of his death, so it will be of some comfort to Mrs Marsland to know that he did not suffer. I am writing to you so that you may soften the blow. “It is a great blow to us all, and his place will not be readily filled, as he was brave and energetic in everything he did. “I am sure I am voicing the battalion in sending their deepest sympathy to Mrs Marsland and your family. “I am here since this morning slightly wounded by shell splinters, and it came as a great shock to hear poor old Jim had gone.